Note : This page is an update ( old version : 25 december 2009 ). Classic kit ( by default in Mypaint 1.1 ) : The aim of this kit is to mimic color range met in traditional art ( exept for the last raw : digital RGB + CMYK pure colors. All color kit ( by default in Mypaint 1.1, Krita, GPS ) : The "All color kit" is a kit for having a wide range of colors. The kit mimic on the top a traditional Photoshop palette ; some user are really used too, it's became a classic. 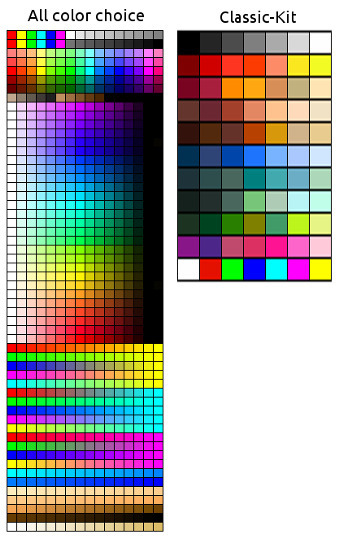 On bottom there is large gradients from white colored passing at middle to the pure color and finishing to the black colored tone, large gradient from a pure color to another one ( ex ; pure digital red / to yellow ), at the end various skin tones. mentioned at the end of the article, 3 january 2013 . Thanx a million... always have had trouble with a proper pallette! This will be a lot helpful, for sure. Bonne Année et mes Meilleurs Voeux pour 2010 ! Un santé de Fer et des couleurs à profusion ! Grâce à DURIAN j'ai découvert ton art, GPS et mypaint !! MERCI ! MERCI !! Hey Thanks a lot for the comments ! @Sévérino: Avec plaisir et merci pour tes voeux, pour Durian je devrais me remettre à travailler dessus en février, mais pas à plein temps. Thank you, I'm just getting started in Gimp, and GPS. This will be useful. thanx for the paletes.. they are SUPER! @Ag : I included your link in my DVD Chaos&Evolutions for ArchLinux users. Thanks ! @William : Palettes for Mypaint were for the Iportnov branch developement ( 0.7 ) . Maybe the palette will re-appear in the 0.9 series. If you install your version from Giterious source code, you can switch to the Iportnov branch and use his version with palette. Hi, I love your work (and your goodies too!). Just a question: is there a way to load your colour palette in the new version of MyPaint? I'm using GIMP 2.6, and i just downloaded your palettes, but I can't seem to figure out how to have them appear with the program. I followed the instructions and put them in the proper folder. Any advice? @AS : If the *.gpl palette files is well pasted into (your-user-name)/.gimp-2.6/palettes/ , you should saw it in Gimp. Try when open Gimp , try in the menu bar to go to Windows>Dockable Panel > Palettes ; and in the palette panel, go to the top : the name is "1-All color for good choice". You can double click on it to use it. Just in case someone is interested, I have read there is a new feature in the "upcoming" stable Gimp 2.10 release (to be released somewhere at the end of 2013...) which concerns the palette tool as well. @Silvio Grosso : Thanks for the link Silvio ( and Happy New Year ! ) ; I ignored those improvements. They feel really advanced. Good because I wouldn't mind to use Gimp as a palette editor now Mypaint and Krita are compatible with the palette files. I actually do it. Thanks again, good info. @syahmi :Hi, you don't need those in Krita 2.8. This one are from 2009 ( 5 years old ) and I'm maintaining the palette into Mypaint and Krita nowadays ( the default ones you have at install ). Just open the Palette dockers ( Settings > Dockers > Palette ) and on the bottom left icon, switch the palette. Thanks. I,m still new in this field. There are still many things I didn't know. BTW, cool tutorial you have here. There is a lot of things that I learn from it. keep up the good works. (sorry for grammar mistakes. english is not my mother language ). @syahmi : I can understand you very well. Thank you ! It keeps encouraging me for next tutorials. @Morten : Hey sorry for late reply, I was traveling. The tar.gz original link open without any problem on GNOME Archive Manager here. I added an alternative link ( zip ) today , maybe *.zip are a bit easier to read for other archive manager. Thanks for the repport! It's really useful and helpful. Thanks for sharing. Could you please tell me what is the GPS Software I saw in many comments ?